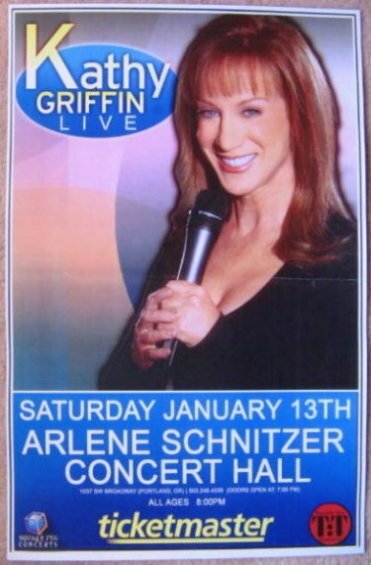 This KATHY GRIFFIN gig poster is rare. It is very hard-to-find since it was a promo only available at ticket outlets and music stores to promote her comedy show. This poster is for her January 13, 2007 show at the Arlene Schnitzer Concert Hall in Portland, Oregon. Size is 11" by 17". It is in real nice condition for display, with some minor wear (a middle horizontal line where it was lightly folded). It will be shipped rolled in a sturdy tube.